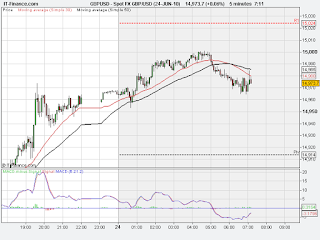 This is the 2Day 5Min Chart for GBP/USD The market is currently trending sideways. A pending BUY order can either be placed just above the HIGH of the sideways trend at 15080 (aggresive traders) or just above the 1st Resistance at 15141 (cautious traders). A pending SELL order has been placed just below the Pivot point at 14996. 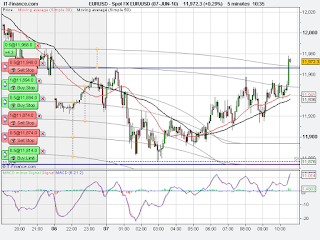 This is the 2Day 5Min Chart for EUR/USD The market is currently trending sideways. A pending BUY order can either be placed just above the HIGH of the sideways trend at 12400 (aggresive traders) or just above the 1st Resistance at 12426 (cautious traders). A pending SELL order has been placed just below the Pivot point at 12337. This is the 2Day 5Min Chart for GBP/USD The USD Durable Goods Orders report is due to be announced at 1.30pm. Markets tend to trend sideways prior to reports of HIGH importance. Trade cautiously before 1.30pm. A pending BUY order has been placed just above the 1st Resistance at 15026 and a pending SELL order just below the Pivot point at 14912. This is the 2Day 5Min Chart for EUR/USD The USD Durable Goods Orders report is due to be announced at 1.30pm. Markets tend to trend sideways prior to reports of HIGH importance. Trade cautiously before 1.30pm. A pending BUY order has been placed just above the 1st Resistance at 12373 and a pending SELL order just below the Pivot point at 12288. The USD Federal Open Market Committee (FOMC) Rate decision will be announced today at 7.15pm. This is a report of HUGE importance that will affect ALL MARKETS. The markets will probably trend sideways till 7.15pm hence trade extremely cautiously (preferably not at all) till after the report at 7.15pm. The emergency budget will be announced today by the chancellor, George Osbourne, at 12.30pm. We will see how the proposed drastic measures to reduce the country's debt will affect the markets. Trade very cautiously before 12.30pm. This is the 1Year Daily Chart for EUR/USD There has been a prolonged rally in the market but it is now pulling back. A pending Swing trade BUY order can either be placed just above the MA50 or at the 23.6% Fibonacci Retracement at 12648. 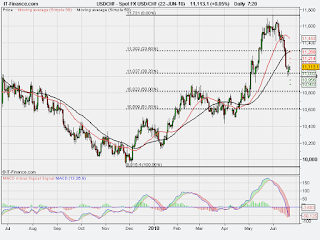 This is the 1Year Daily Chart for USD/CHF The market reached the 38.20% Fibonacci retracement and rallied back up. A pending swing trade Sell order has been placed at the 38.20% retracement, 11037. The market is currently trending sideways and is also above the 1st Resistance. There are no safe trading opportunities at the moment. 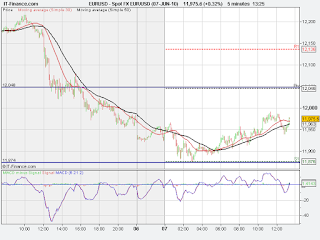 This is the 2Day 5Min Chart for EUR/USD The market is currently trending sideways and is also above the 2nd Resistance. There are no safe trading opportunities at the moment. 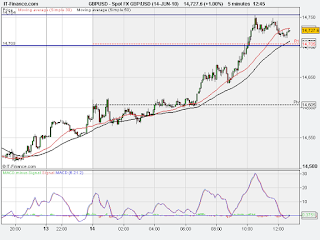 This is the 2Day 5Min Chart for GBP/USD The market is currently trending sideways. There is a report of HIGH importance due out at 1.30pm. Trade with caution prior to report. A pending BUY order has been placed just above the Pivot point at 14768 and a pending SELL order just below the 1st Support at 14673. This is the 2Day 5Min Chart for GBP/USD The pending SELL order just below the Pivot point at 14771 was taken at 8.35am with a STOP loss of 20points and PROFIT limit of 60points in place. No further trading till after the economic reports. 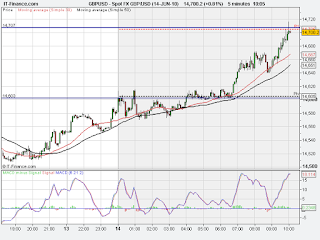 This is the 2Day 5Min Chart for GBP/USD The market is currently trending sideways. There are reports of HIGH importance due out at 9.30am and 10am. Trade cautiously before these reports are released. A pending BUY order has been placed just above the 1st Resistance at 14864 and a pending SELL order just below the Pivot point at 14771. 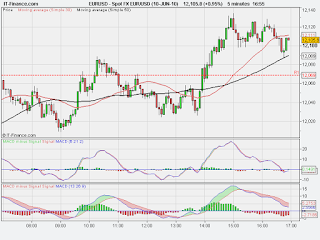 This is the 2Day 5Min Chart for EUR/USD The market is currently trending sideways. There are reports of HIGH importance due out at 9.30am and 10am. Trade cautiously before these reports are released. A pending BUY order has been placed just above the 1st Resistance at 12390 and a pending SELL order just below the Pivot point at 12278. 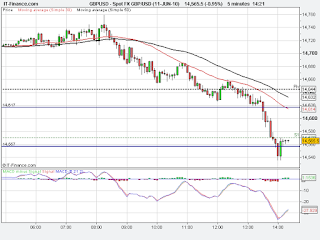 This is the 2Day 5Min Chart for GBP/USD A pending SELL order was placed just below the Pivot point at 14702. This order was taken with a resulting loss of 20points. In view of reports of HIGH importance due out at 9.30am, no further trades will be placed till after the reports. This is the 2Day 5Min Chart for EUR/USD The market is currently trending sideways around the Pivot point and reports of HIGH importance are due out at 9.30am. A pending BUY order has been placed just above the 1st Resistance at 12297 and a pending SELL order just below the 1st Support at 12137. 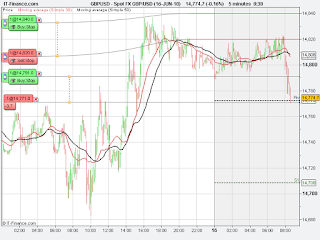 This is the 2Day 5Min Chart for GBP/USD The Profit target of 60points was reached at 1.20pm. No further trading today. 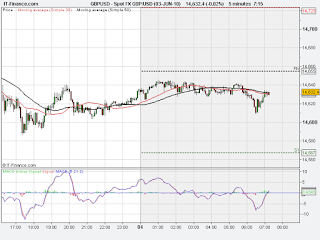 This is the 2Day 5Min Chart for GBP/USD The MA50 is now above the 1st Resistance (R1). A pending SELL order has been placed just below R1 at 14703. 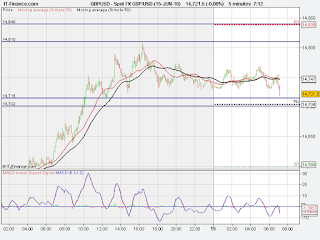 This is the 2Day 5Min Chart for GBP/USD The market has moved halfway towards the target of 60points. The Stop loss has been moved to the opening level of 14707 hence protecting our capital. The profit limit has been left in place. This is the 2Day 5Min Chart for GBP/USD The pending BUY order at 14707 was taken at 10am with a Stop loss of 20points and Profit limit of 60points in place. 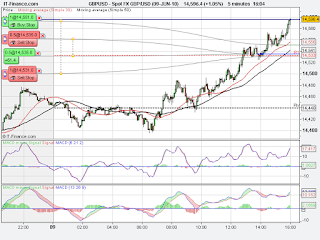 This is the 2Day 5Min Chart for GBP/USD The market is begining to uptrend. A pending BUY order has been placed just above the 1st Resistance at 14707 and a pending SELL order just below the Pivot point at 14603. This is the 2Day 5Min Chart for EUR/USD The market is currently trending between the 2nd Resistance (R2) and the 1st Resistance (R1). R1 is acting as a support for the market. A pending SELL order has been placed just below R1 at 12160. This is the 2Day 5Min Chart for GBP/USDJust before the economic report at 1.30pm, a pending SELL order was placed just below the most recent low of the market at 14617.The order was taken at 1.30pm just after the economic report was announced and the profit target of 60points was achieved at 1.55pm. No further trading today. This is the 2Day 5Min Chart for GBP/USD The pending SELL order at 14642 was taken at 11.30am with a Stop loss of 20points and Profit limit of 60points in place. No further trading till after report at 1.30pm. 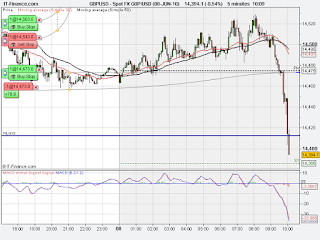 This is the 2Day 5Min Chart for GBP/USDThere is a report of HIGH importance due out at 1.30pm. Trade with caution prior to 1.30pm.A pending BUY order has been placed just above the 1st Resistance at 14781 and a pending SELL order just below the Pivot point at 14642. 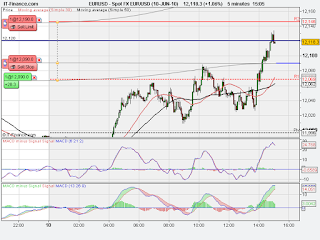 This is the 2Day 5Min Chart for EUR/USDThere is a report of HIGH importance due out at 1.30pm. Trade with caution prior to 1.30pm.A pending BUY order has been placed just above the 1st Resistance at 12180 and a pending SELL order just below the Pivot point at 12066. This is the 2day 5Min Chart for EUR/USDThe Stop Loss at the opening level of 12090 was taken 4.45pm with NO loss.Net loss for the day was 20points. No further trading today. 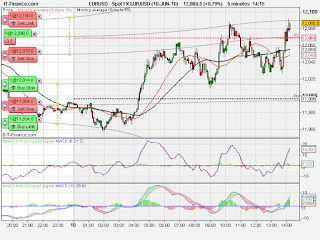 This is the 2Day 5Min Chart for EUR/USDThe market has moved halfway towards the target of 60points. 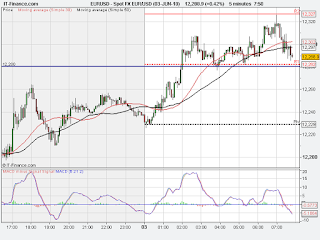 The Stop loss level has been moved to the opening level of 12090 in order to protect capital. This is the 2Day 5Min Chart for EUR/USDThe pending BUY order at 12090 was taken at 2.10pm with a Stop Loss of 20points and a profit limit of 60points in place. The Bank of England Interest Rate decision is due out at 12noon. Trade carefully before 12noon. A pending BUY order has been placed just above the 1st Resistance at 14640 and a pending SELL order just below the Pivot point at 14515. 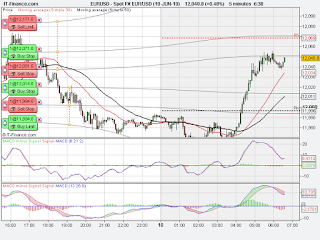 This is the 2Day 5Min Chart for EUR/USD The EUR Central Bank Interest Rate decision is due out at 12.45pm. Trade carefully before 12.45pm. A pending BUY order has been placed just above the 1st Resistance at 12071 and a pending SELL order just below the Pivot point at 11994. 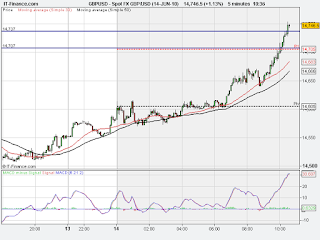 This is the 2Day 5Min Chart for GBP/USD The profit target of 60points was reached at 4pm. No further trading today. 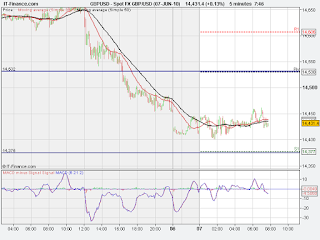 This is the 2Day 5Min Chart for GBP/USD The market has moved halfway towards the target of 60points. 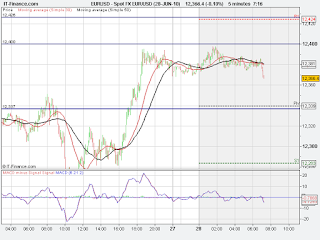 The Stop loss level has been moved to the opening level of 14535 in order to protect capital. The profit limit of 60points has been left in place. This will be the last trade for today. This is the 2Day 5Min Chart for GBP/USD The pending BUY order at 14535 was taken at 12.50am with a Stop loss of 20points and Profit limit of 60points in place. 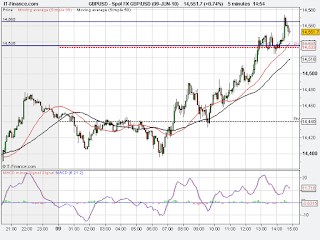 This is the 2Day 5Min Chart for GBP/USD The market has now advanced and it is now close to the 1st Resistance. The pending SELL order has now been moved from just below the 1st Support to just below the Pivot point at 14438. 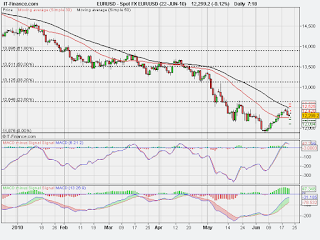 The pending BUY order just above the 1st Resistance at 14535 has been left in place. 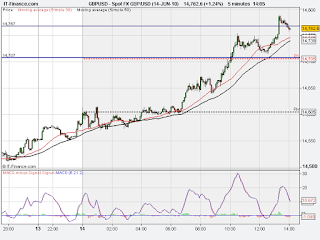 This is the 2Day 5Min Chart for GBP/USD The market is currently trending sideways. A pending BUY order has been placed just above the 1st Resistance at 14535 and a pending SELL order just below the 1st Support at 14349. 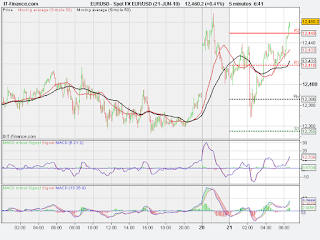 This is the 2Day 5Min Chart for EUR/USD The market is currently trending sideways. A pending BUY order has been placed just above the 1st Resistance at 12020 and a pending SELL order just below the 1st Support at 11909. This is the 2Day 5Min Chart for EUR/USD In view of the profitable GBP/USD trade below and the 20+ points movement in our direction in this market, the Stop loss level has been moved to the opening level in order to protect our capital and today's profit. The Profit limit of 60points has been left in place. This is the 2Day 5Min Chart for GBP/USD The pending Sell order at 14473 was taken at 9.30am and the profit target of 60points was achieved at 10am. Following this profitable trade, no further trades today on this market. This is the 2Day 5Min Chart for EUR/USD The pending Sell order at 11928 was taken at 9.55am with a Stop loss of 20points and Profit limit of 60points in place. This is the 2Day 5Min Chart for GBP/USD A pending BUY order has been placed just above the 1st Resistance at 14563 and a pending SELL order just below the Pivot point at 14473. This is the 2Day 5Min Chart for EUR/USD A pending BUY order has been placed just above the 1st Resistance at 11986 and a pending SELL order just below the Pivot point at 11928. This is the 2Day 5Min Chart for GBP/USD The pending Buy order at 14532 was taken at 3pm with a Stop loss of 20points and Profit limit of 60points in place. 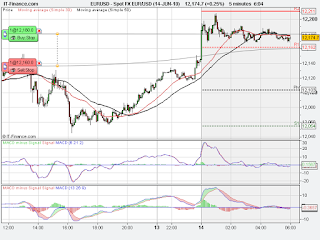 This is the 2Day 5Min Chart for EUR/USD The Stop loss was taken at 12.50pm with a loss of 20points. A pending Buy order has now been placed just above the Pivot point at 12048 and a pending Sell order just below 1st Support at 11874. This is the 2Day 5Min Chart for EUR/USD The pending BUY order just above the high of the sideways trend at 11968 was taken at 10.30am with a Stop loss of 20points and Profit limit of 60points in place. This is the 2Day 5Min Chart for EUR/USD The market is currently trending sideways following a huge move in the market on friday. A pending SELL order has been placed just below the 1st Support at 11874. A pending BUY order can either be placed just above the High of the sideways trend at 11968 (aggresive traders) or just above the Pivot point at 12048 (cautious traders). This is the 2Day 5Min Chart for GBP/USD The market is currently trending sideways after a huge move in the market on friday. A pending BUY order has been placed just above the Pivot point at 14532 and a pending SELL order just below the 1st Support at 14375. This is the 2Day 5Min Chart for GBP/USDThe market is currently trending sideways. Advisable to wait till after the non-farm payroll report at 1.30pm before trading this market. This is the 2Day 5Min Chart for EUR/USDThe market is currently trending sideways. Advisable to wait till after the non-farm payroll report at 1.30pm before trading this market. This is the 2Day 5Min Chart for GBP/USDThe market is currently trending between the 1st Resistance (R1) and the Pivot point.A pending Buy order has been placed just above R1 at 14763 and a pending Sell order just below the Pivot point at 14655. This is the 2Day 5Min Chart for EUR/USD The only possible trade at the moment is a Sell trade just below the 1st Resistance (R1) at 12280. This is the 2Day 5Min Chart for GBP/USD The pending Sell order just below the Pivot point at 14607 was taken at 1.35pm with a Stop loss of 20points and Profit limit of 60points in place.